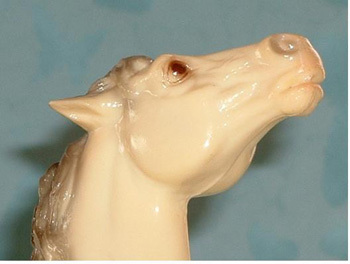 Retired Breyer model horses are made from a mold that is no longer available to make new models. For that reason they are highly coveted by collectors. To the left is the Running Stallion Glossy Charcoal, made between 1968-1971, which is a retired model. Retired models are often, but not always, vintage models as well. To earn the distinction of "vintage", a model must be of a certain age, while a retired model can be relatively recent, just simply not made any more. Visit my Vintage dappled and woodgrained Clydesdales breyer models. There are little details with these older and/or hard to find models that can make collecting them so much fun, almost like a treasure hunt. And the reward when you find one is outstanding. 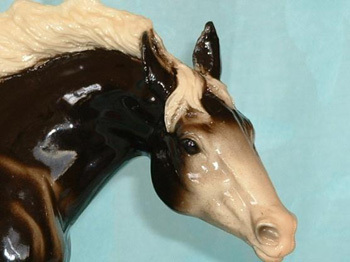 For example, one very interesting detail that make Retired Breyer Model Horses highly sought after by collectors, is what is called the "red eye". To the right is a Mustang Glossy Alabaster that was made from 1961 through 1966. If you look carefully at the model, you can see a brownish red glow around the model's eye. It is not actually a red red, but more of a brown eye with a "glow". The red glow can be seen more easily seen on some models than others. Compare this to the Retired Charcoal Running Stallion above, which has the typical black eye.